On Wednesday, July 2, I joined a group from Phoenix of their Young Leadership, and visited a few places in Hof Ashkelon. One site that really grabbed my attention was the Trauma Center for children in Bat Hadar, where the regional (county) council is located. Ten years ago, when San Diego was part of the Western Region of Partnership 2000, they donated funds for the construction of this building. When qassam rocket shelling from Gaza started eight years ago and with the increase of rockets since the Gaza pullout began, this center has met a critical need in the region. It functions in two ways: Psychologists go out to the 20 communities in the region to meet groups when there is a critical need and also visit with the schools. In addition, a variety of different therapies are offered in the center including animal, music, art, group and family therapy. We heard from two members of the staff. Manit is one of the psychologists. She made aliya from Holland twenty years ago and the past two years she works a lot with the youth and families who moved Gush Katif in Gaza. A few weeks ago, she met with teens at Kibbutz Gvaram who were dealing with the death of an adult kibbutz member. Here is the story. 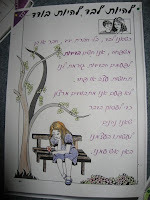 Shuli had left the kibbutz and went to visit her sister in Yesha because it was thought to be safer. As she got out of her car by her sister’s home, a rocket hit and she died soon after. Ironically, Gvaram, her home, has not been hit by a qassam—yet. Many of the teens knew Shuli. The teens do gather strength by being part of a close-knit community, but some were having problems dealing with the death. A few had gone to the funeral, but one boy, for example, was frightened about going. A girl had known Shuli well and was having trouble going back to school , crying most of the time. Manit helped the teens to understand that they were having normal feeling after a horrible event and that they were not alone and could support each other. She also taught them coping skills to work through their feelings. 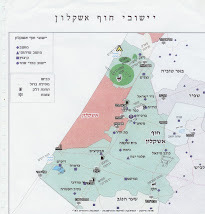 Many of these teens go to Shaar Hanegev secondary school, which is located right next to Sderot, the town that is the most frequent target of qassam rockets. Qassams have fallen on their school, damaging property, injuring a few people, and killing a teacher. So Manit has visited their school too. With the recurring bombing, the teens are much more susceptible to depression then if the event (like a damaging earthquake) only occurred once. Manit gave a few examples of how art therapy helped children. One young girl had nightmares of people bleeding after a qassam landed in her community and was afraid to sleep at night. 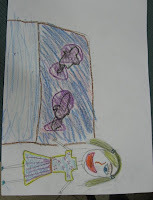 In art therapy at the center, she was asked to draw pictures of her nightmare. One was herself next to a pool of blood. The therapist asked if she could make something positive from the drawing, and she changed the blood to blue water, learning that the negative event need not permanent. Unfortunately because of a quirk of this program, the pictures will not load property. In addition, we hear from a man who by developing a way to help children overcome their fears through animal therapy, has helped many and has become one of the leaders in this field in Israel . He gave us examples of how he used a stick bug, a corn snake, and a large Labrador dog to help the children overcome their fears. 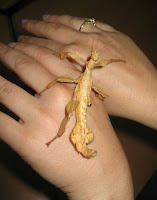 When he brought out the stick bug, he called it a scorpion, and several people in our group gasped. Children do the same. He then explained to us—and to them—that though it looks like a scorpion, it actually is a harmless stick bug, that eats eucalyptus leaves and can hide in the leaves. They learn to touch and then hold it and see that they don’t have to be afraid of it. He then brought out a snake. Many children are afraid of snakes, and there are poisonous ones in Israel. He shows them the tail, and asks if they are afraid of it. When they reply that they are not, some actually touch the tail. He then shows them other parts of the snake, and it turns out that they are just afraid of the tongue. When troubled children first come to pet therapy and view all the animals, 90% identify with the snake because it is scary, eats mice, and they identify with the mice eaten by the snake. As they lose their fear of the snake, they start to lose their fears from the qassams. Animal therapy works much faster than regular therapy for children ages 4 to 16 or 17 and is highly successful. Eli also has a big Labrador which has a loud bark. AT first the kids are very frightened but they see that the dog is really a sweetie. Also, when the psychologists talk to the children about their fears with animals in the room, they often feel more comfortable talking to the animals and not to the adults in response to the psychologists’ questions. Tucson has helped to fund this animal therapy program. 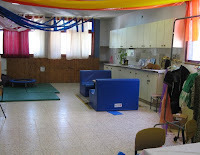 In addition to this center, the region is creating “tranquility rooms” in four or five schools in the Hof Ashkelon area for youth from kindergarten through grade 9. These rooms are for children feeling trauma who have less severe problems than those sent to the regional Trauma Center. Two will be in Nitzan, where 500 families evacuated from Gaza live, one i in the girls’ school and the other in the boys’ school. 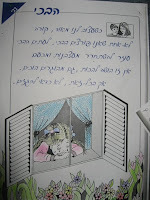 Another, which I saw, is in Hofim School on Kibbutz Yad Mordechai. The room has child-size soft comfortable furniture and pictures with explanations the children had colored on feelings (crying, being alone a feeling lonely, for example). and another that labels the room, “My Safe Place." The need for such rooms is the reality in this area of Israel now. This is great stuff. Thanks so much for sharing this important work that is being done. I'm going to pass it on the Creative Arts Therapy dept (CAT)at the Kline Galland Home, as well as to others for educational and advocacy purposes.